Nestled down a pretty cobbled lane just off the village green in Reeth you’ll find Dalesmoor - a very attractive, stone-built, 17th century, Yorkshire Dales holiday cottage. This holiday cottage in Swaledale has recently been renovated by the owner. The careful introduction of modern furnishings compliment the original features perfectly and creates an extremely comfortable and well-appointed holiday home. You’ll feel immediately at home in this holiday cottage as it has all the home from home comforts that you shall require. You enter the cottage into a beautiful dining area with multi-fuel stove which leads into the newly fitted kitchen. The kitchen leads out to a quaint patio at the rear of the cottage with wonderful views of Fremington Edge. The patio provides a perfect spot to dine alfresco or to enjoy a glass of wine in the summer months. The holiday cottage also benefits from a good size living room with wood burning stove, TV, FreeSat and Free Wifi. Electric cooker. Microwave. Washing machine.Iron, Ironing board. Dishwasher. Fridge/freezer. Outside: Patio to the rear with garden furniture including table and chairs. Fantastic views to Fremington Edge. Patio to front of property with bench. Cleaning / Towels / Linen / Maid service: To ensure your stay is as comfortable as possible all kitchen linen, bed linen, towels initial supply of fuel for the fires are provided and the electric and oil are included in the rental price. Other: The cottage has a beautiful dining area with multi-fuel stove which leads into the newly fitted kitchen. 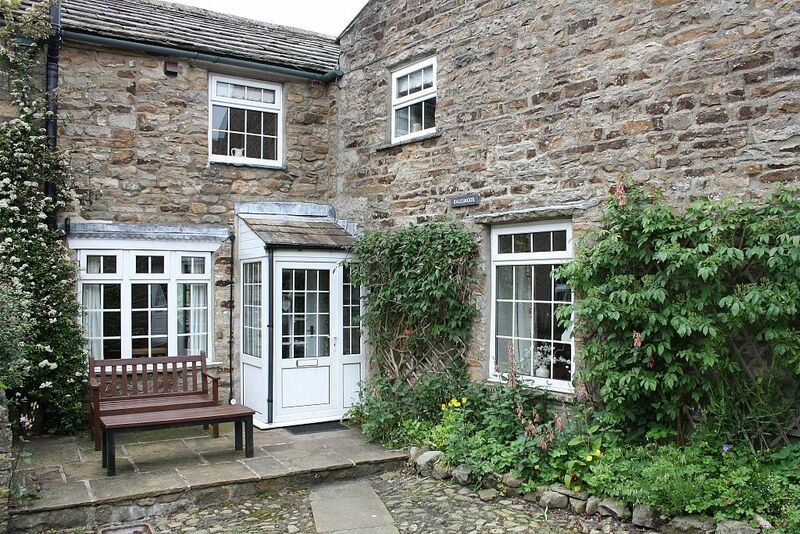 Lovely cottage in a charming Dales village! Great location in Reeth village with its 3 pubs. Charming cottage, located down a quiet cobbled lane, just off of the village green. Fab walks from the door. Would definitely recommend. We loved Dalesmoor. A beautifully appointed and cosy cottage in beautiful Reeth. Tucked down a side lane it was peaceful and secluded with an amazing view from the kitchen window. The house is to a very high standard and the kitchen is very well equipped. We loved the log fire in the cosy living room. Dalesmoor is a lovely, cosy cottage in a quiet, peaceful area. The views of Fremington Edge are great to wake up to. The cottage has everything you need for a self catering holiday. There is a nice terrace at the back and bench at the front if you want to sit out. The area is great for walking and there are lots of good pubs and eateries nearby. We have stayed in the area several times and this is our first time at Dalesmoor which is our best find so far - and good value. Relaxing, comfortable and wonderful views - what more could you ask for. Beautiful comfortable clean well equipped cottage in a lovely location. Beautiful view from the patio to sit in the morning with a coffee or a glass of wine in the evening. Kitchen equipped with everything you’d need if cooking though with Reeths abundance of pubs and tea rooms you never need to cook. Nice spacious sitting room and seperate dinning room. Nice having a bath room downstairs as well as the en suite in the double room. Could imagine being in there in the winter with the log burner going. Was an excellent find. Excellent. Very clean ,warm and welcoming. A lovely cottage.It has everything you need and more besides. Very comfortable and warm. Stunning views from kitchen and bedroom.We enjoyed our stay with walks from the cottage. Well equipped property in an excellent location. Great views and very clean. Booking Notes: Please contact the Hannah and Sally-Ann with booking enquiries. A deposit will be required at the time of booking and a booking reference will be supplied. Outstanding amounts are required 8 weeks before the start of your holiday. Payments by card, BACS or cheque all welcome. Written confirmation of holiday will be received including details of how to obtain keys for the property. Please notify Hannah or Sally-Ann of any special requests or queries that you have. Changeover Day: Changeover day is Saturday. Arrival after 4pm, departure before 10am. Notes on prices: Cancellation policy, deposits are non-refundable.